Promise Day is the 5th day of Valentine’s Week, and on this day lovers make many promises to their partner. Not having a good relationship is done by doing it. Relationship plays well only when the promises made by each other are good enough. Promises are done on one another’s faith, and with the same faith we must fulfill them so that our partner can always remain loyal to us. 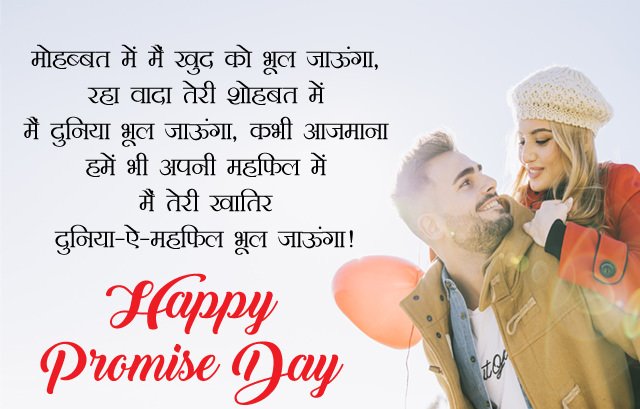 In this article you will find Happy Promise Day Shayari in Hindi Language, 11th Feb Wishes in Hindi which you can share with your lover. आपके जीवन में सजाने का वादा है. तेरी चाहत को दिल में बसाये रखूँगा. बस खुशियां तुझ पर लुटाएंगे. रहेंगे हमेशा तेरे साथ हम. रहेंगे साथ आखरी दम तक. मेरे दिल में सजाने का वादा करो ! मैं तेरी खातिर दुनिया-ऐ-महफिल भूल जाऊंगा!